fixed your links that is a sweeeeeeeeeeeeet mk5 love it what engine do u have ? Cheers mate. 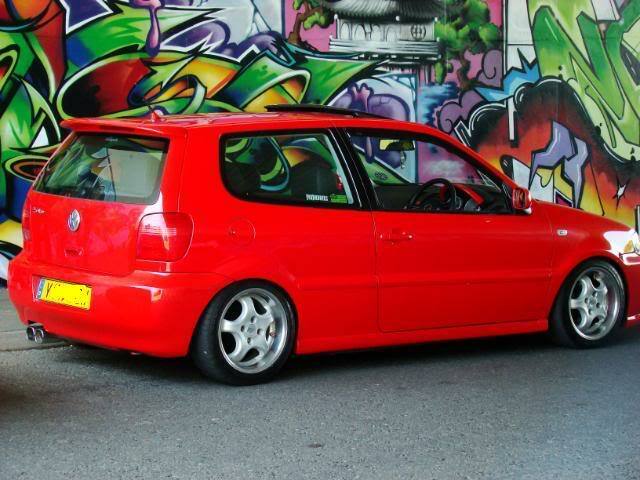 Its a 1.4 8v (60bhp) would have got a GTi but its my first car. There ya go matey, fixed the pics for yas. Nice car ya got... looks clean. Thats one really nice polo...like it! Fair play dude, for a first car, that looks sweeeeet. Clean as in.. well.. guess I shoulda said Tidy, hehe. sweet motor! thtas alex 6n2 old motor off clubpolo!! i would put in a gti engine!! have u told the insurance about the mods? Always liked this car. Still looks good! I've seen really low cars doing this in Belgium, lol.. but erm, they tended to just go over them diagonally... if you change direction halfway over.. it's the same as if you went straight over it.